Let Jack, Greg, and Aaron Inspire Your Group and Give Them the Tools to Create Meaningful, Sustainable Change. Too many people are going through the motions of living. We’re not thriving. We’re grappling with fear, resentment, depression, or discontent in some area of life. People from all walks of life are searching for a path toward greater balance, personal power, and genuine happiness. Jack Skeen, Greg Miller, and Aaron Hill—coauthors of The Circle Blueprint—share with audiences a powerful framework for creating a thriving and successful life. Our system helps people identify destructive patterns, beliefs, and mindsets that inhibit their success and walks them through the steps necessary for awareness, growth, and self-mastery. We speak to all industries and entrepreneurs at all levels of success. We will gladly share our message with and tailor a presentation or workshop for almost any audience. Business Leaders. Thriving companies can’t exist without thriving leaders. It’s crucial to help them shift their equilibrium and become authentic “whole” people. This is the only way to master the four key developmental areas needed to lead and inspire others in the global economy. HR Professionals. More and more organizations are realizing that when they nurture “whole person” well-being, they create happy, productive employees; improve morale; and minimize turnover. 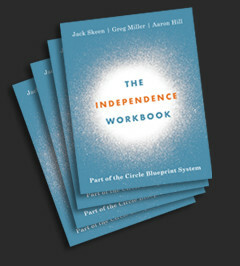 The Circle Blueprint System creates a common language for engagement at work and in all areas of life. Entrepreneurs. Often, entrepreneurs get their business to a certain point and hit a wall. Our presentation helps them unearth the unconscious factors that break their momentum and hold them back from achieving their full potential. Students. We help young people get a thorough understanding of the skill set that will determine their future success—innovation, collaboration, communication, etc.—so they can start making needed changes now, before they hit a tough job market. Individual Employees. As 21st century employees, we all “own” our own professional development; as human beings we are responsible for our own fulfillment and happiness. We help audience members pinpoint the bad habits and flawed thinking that hold people hostage to jobs, relationships, and other circumstances that aren’t working for them. Women. Too often, women feel helpless and hopeless about their ability to make changes in their lives and relationships with spouses, children, friends, and colleagues. We help open their eyes to the power they possess and share the tools they need to take charge of their own well-being.